Just a quick update from Maui, where I’m in the midst of my annual Maui workshop (and because there’s nothing better to do when you wake up at 4 a.m. than post a blog). Before the workshop started I held my breath as I warned my group that on our first morning we’d need to leave at 3:30 to photograph sunrise from the 10,000 foot summit of Haleakala. Not only that, they should pack for temperatures in the 30s and wind. Oh yeah, and there’s a chance that the summit would be engulfed in clouds and we’d see absolutely nothing. The only defense I could offer the insane start time was that everyone needs to watch the sun rise from Haleakala at least once in their life. Yesterday was the day. To ensure that we’d all be able to find a place for our tripods, we arrived an hour before the 6:45 sunrise. Exiting the car at the Haleakala Visitor Center vista, I looked upward, found a sky filled with stars, and immediately whispered a quick thank you to the photography gods. In addition to clear skies, relatively calm wind made the 35 degree temperature feel downright balmy. It seems that each time I do this, Haleakala’s a little more crowded. Some in the group stayed with the masses lined along the rail at the primary view; those who didn’t mind a short but steep climb in thin air followed me a few hundred yards up a nearby trail to an elevated, less crowded view. By the time the sun rose, I’d been playing with compositions long enough to have a pretty good idea what I wanted to do. Because of the scene’s extreme dynamic range, I decided to use my new Sony a7S, adding a Singh-Ray 3-stop reverse graduated neutral density filter, a combination that allowed me to capture this shot with a single click. I’ve never been able to capture so much foreground detail, while retaining color in the sun, in a single frame. To get the sunstar, I stopped down to f20 and clicked just as the sun peeked above the horizon. Our sunrise success was a great start to what proved to be a wonderful (albeit long) day of photography. We descended the mountain shortly thereafter, and after a quick Starbucks recharge in Kahului, wrapped up our morning with a nice shoot in the lush Iao Valley. The afternoon included a sensor cleaning seminar, a blowhole (accented with a few whale sightings), and a cloudy but beautiful sunset on a hidden volcanic beach. Today it’s the Road to Hana…. Hi Gary, can you use my deposit for this workshop next year? Hi Pat. If you’re asking whether you can switch from the Hawaii 2015 workshop to the Maui 2016 workshop, the answer is yes. Just let me know and I’ll move your deposit. You can be my charter member, Richard. Gary, Your pics are wonderful and set a great example for the rest of us. A few years ago Babs and I rode bikes down from the top of the volcano but we didn’t have cameras with us. I’m talking you up among my photo friends. Thanks, Barry. Yeah, we dodged cyclists all the way down the mountain. This image is absolutely incredible Gary! Man!!! I mean, it’s like you’re up there with the gods..Such a wonderful image….Really glad you had great conditions and such a wonderful day…Best of luck for the remainder…ps – our temps shot up to 32 here yesterday…freezing rain and ice! Thanks, Denny. Yeah, up there with the gods is exactly how it felt. Beautiful image Gary. Can you explain what a reverse graduated neutral density filter is? How long was the drive up there from the hotel? Thanks, Rhonda. A standard GND is darkest at top and lightens as it moves toward the middle; a reverse GND is darkest in the middle and lightens as it moves to the top. It’s good when the horizon is the brightest part of the scene, especially when sun is right on the horizon. 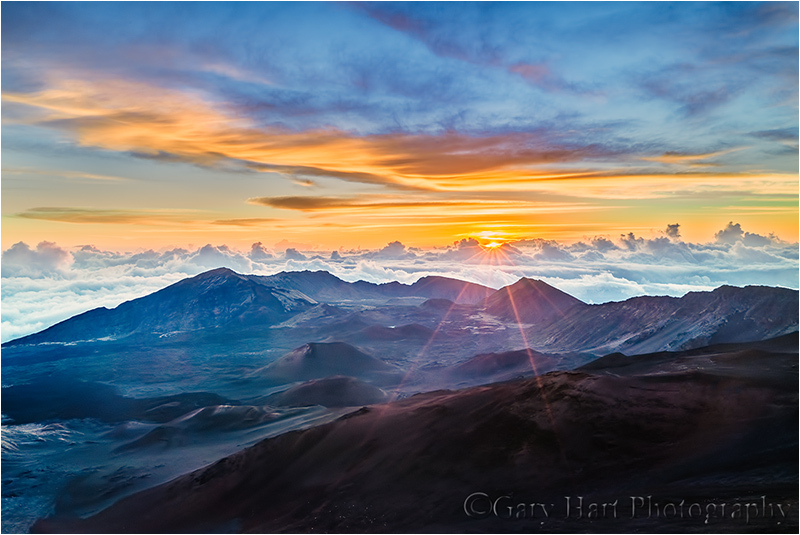 Gary–i’ve seen a lot of great shots from you , including the night scene at Haleakala crater last year BUT, this shot takes the cake. since, i was there, i know how exceptional it is and how much thought went into this shot. Thanks, Charlie. And you also know that more than extreme light, the crowds made it particularly challenging. We were so fortunate that the calm wind made the cold manageable. I’ve been up there with 35 MPH wind, so imagine factoring that in along with all the other difficulties.